Unfortunately, by default, DNS is usually slow and insecure. Your ISP and anyone else listening in on the Internet can see every site you visit and every app you use — even if their content is encrypted. Creepily, some DNS providers sell data about your Internet activity or use it to target you with ads. 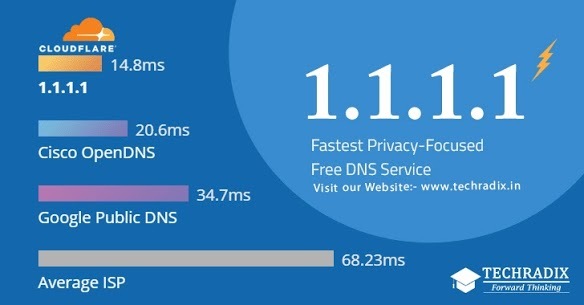 Cloudflare, well-known Internet performance and security company, announced the launch of 1.1.1.1—world’s fastest and privacy-focused secure DNS service that not only speeds up your internet connection but also makes it harder for ISPs to track your web history. Domain Name System (DNS) resolver, or recursive DNS server, is an essential part of the internet that matches up human-readable web addresses with their actual location on the internet, called IP addresses. Cloudflare had the network. APNIC had the IP address (1.1.1.1). Both of us were motivated by a mission to help build a better Internet. You can read more about each organization’s motivations on our respective posts: Cloudflare Blog / APNIC Blog. For more information see: What is 1.1.1.1?